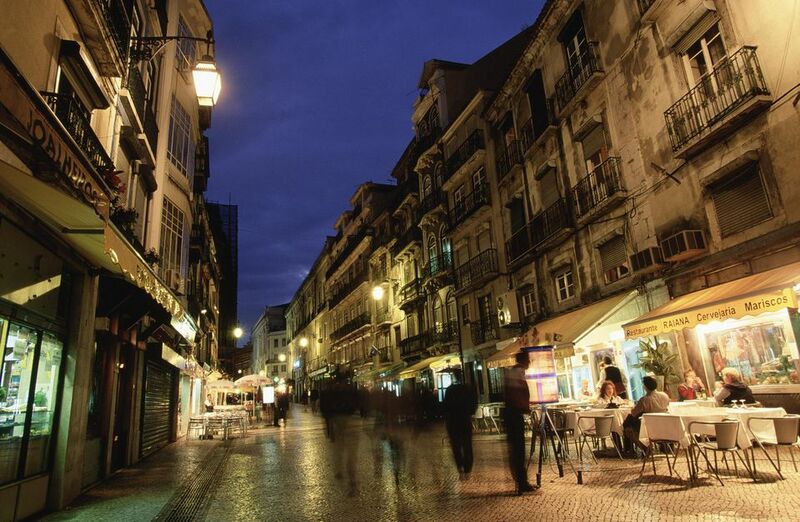 Like every European capital, Lisbon’s nightlife is as interesting and varied as anything you’ll find back home. Whether your interests run to bar-hopping or clubbing, taking in a show, checking out the local culture, or just relaxing beside the water or at a hilltop viewpoint, the Portuguese capital doesn’t disappoint. Lisbon is known as the city of seven hills, and with good reason — once you get away from the river, your calves will be getting a workout no matter which direction you head. The (literal) upside? From almost anywhere in the downtown area, it’s easy to get a great night-time view of the city. Many of the highlights, including the famous castle, are illuminated after sunset, making for some wonderful photo opportunities. Whether you head to a swanky rooftop bar like Silk Club or Sky Bar, or just grab a drink from a nearby ( kiosk) quiosque at one of the city’s endless collection of lookout points, you’re guaranteed spectacular views in every direction. Just remember to take a light sweater or jacket with you — even after scorching summer days, it can get a bit breezy in Lisbon after dark. The slow, soulful sound of Lisbon’s famous fado spills out of tiny bars and venues throughout the city, and it’s well worth planning a night around this centuries-old musical style. Doing so has become a bit of a tourist trap, but if you manage to avoid the ‘fado and dinner’ packages advertised everywhere in Bairro Alto and Alfama, you’ll be rewarded with lower prices, better food, and a more local experience. There are dozens of hole-in-the-wall places to chose from — just follow your ears — or head to O Povo, which has free weekday shows from 8 pm featuring up-and-coming performers. It’s worth visiting the Fado Museum in Alfama ahead of time, to learn more about the history of this unique tradition. Back in the ’90s, Lisbon was one of the biggest clubbing cities in Europe. While it’s been overtaken in recent years, there are still plenty of options, catering to every taste. Don’t expect to head home before dawn, whether you’re dancing at Music Box in the red-light district of Cais do Sodre, Dock’s Club down near the bridge in Alcântara, or at glamorous, high-end venues — with prices to match — like Lux on the waterfront. Whether you’re after the best international DJs, old-school pop from the 80s, or pretty much anything in between, Lisbon’s clubs have got you covered. The more exclusive places have strict dress codes and door policies, with some requiring reservations ahead of time. No matter which club you're planning to visit, dress to impress, don’t expect anywhere to be open before midnight, and prepare to party until the sun comes up. While Lisbon doesn’t attract as many big-name acts as larger cities like Madrid or London, there’s still no shortage of musical options for visitors to check out. As with anywhere else, plan to book well in advance for a favorite act – other than the MEO Arena, most venues are relatively small, so tickets sell out quickly. Lisbon’s grand old opera house, Teatro Nacional de Sao Carlos, sits in Chiado, the heart of the city, and is a must-visit for lovers of the classics. Wagner, Mozart, Stravinsky, and many other composers are regularly performed in this small, but beautiful, theater that dates back to 1793. While it’s possible to book online, you can usually get seats for all but the most popular shows just by showing up at the box office a few days in advance. Your hotel concierge may also be able to help arrange tickets if needed. Football is an obsession in Lisbon, and with Portugal winning the Euro championships for the first time in 2016, and local team Benfica taking out a fourth straight Portuguese league title the following year, the sport is riding higher than ever. Benfica’s large Estadio da Luz (Stadium of Light) sits north of the downtown area, while their great rivals, Sporting Lisbon, have any equally impressive stadium just a couple of miles away. Unless there’s a local derby during your stay, it should be possible to get tickets for a home game featuring one or the other team if you’re in town during the lengthy football season. Buy a scarf or some other way of showing your allegiance, head along to the stadium nice and early to make the most of the atmosphere, and prepare for a night to remember, whatever the result of the game!